Sometimes I just need to escape my busy life in London, so when I had a visiting cousin recently I took him out to see Hampton Court. Less than an hour train ride from our apartment, Hampton Court was the home of King Henry VIII, King William II and III and other English royalty. While this was my second visit inside the castle, the spring gardens is where I wanted to explore the most. April is a perfect month to visit to see cherry blossoms, daffodils, pansies, tulips, hyacinths and other spring flowers. Back in Henry VIII’s time, the renaissance garden was established in the 1530s as a private garden designed to outshine the French Fontainbleau. Then, under King William III (1689-1702), the gardens were designed with “parterres a l’Anglaise” (English-style beds) with intricate patterns cut into the turf and filled with colorful gravel. These are framed with narrow borders displaying topiary, bulbs and annual plants. Using detailed accounts, the Privy Gardens, as they are called, have been restored to their former glory as they were in the 18th century. “The Privy Garden represents a formal style of gardening which fell out of fashion soon after the garden was originally made. Its geometry is not to everyone’s taste but many find it extremely pleasing to the eye.” Account by Susanne Groom, curator of the Gardens Exhibition. The gardens are gorgeous! Next time, I’d remember to bring a picnic lunch as plenty of people were enjoying the lovely spring day we had with temperatures nearly 20C degrees in April! That’s short-sleeve weather in England people! 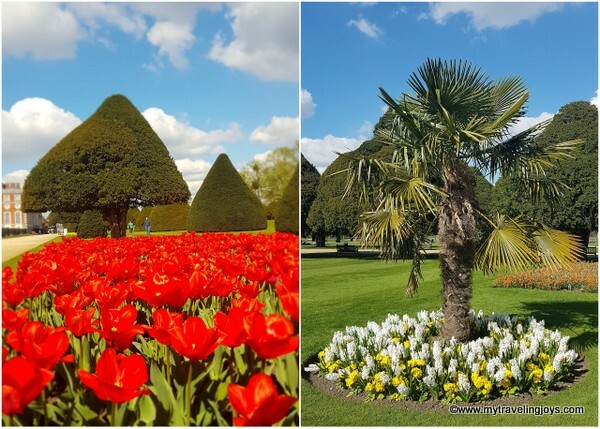 Hope you enjoy this photo post from our spring day out to Hampton Court! In the 1690s, the sheltered, south-facing pond yards were transformed by Mary II to display her rare and exotic plant collection. This garden became known as the Orange Quarter. Mary displayed her citrus fruit trees here in the summer. In the winter months, the plants were sheltered from the weather in nearby heated glass cases made by the Dutch carpenter Hendrick Floris. The Pond Gardens originally were used to hold freshwater fish for the royal courts. Horse-drawn charabanc, based on the late 19th- century charabancs that brought visitors to Hampton Court, can be hired for a short (and expensive) ride around the grounds. The canal, inspired by Versailles and runs 1.6 km long at a 90-degree axis of Henry VIII’s original garden. magnificent isn't it? it sure keeps lots of gardeners busy! I for one adore that gardens geometry - it seems like everything is in its place and nothing was established randomly but in an organised fashion. It looks great, I'e never been there and I'm afraid I'll have to add it to my ever-growing list of places to see in and around London!